Featured image: gardens at the Whipple House in Ipswich. After Col. Smith enlisted again during WWII, Isadore wrote While We Are Absent, about how she maintained the home and gardens and raised the children without him. Col. Smith died in 1962. In 1967, as a member of the Ipswich Garden Club, she took on a project with the Ipswich Historical Society to create a traditional seventeenth century rose garden at the Whipple House. In 1977 she and Katharine C. Weeks designed the gardens at the Weeks Brick House in Greenland, NH, described as a typical housewife’s garden of the late 17th century, including the herbs and plants essential for a New England household. Early American Gardens, published in 1970, the first of her three authoritative volumes of garden history, is a 464-page masterwork of garden history, reissued in paperback by the University of Massachusetts Press in 1986. Concentrating on the gardens of the early settlers of New England, the book deals with gardeners as well as the plants they depended upon for household aids, flavorings, drinks, and medicines. The well-illustrated and scholarly volume appeals to history buffs as well as avid gardeners. 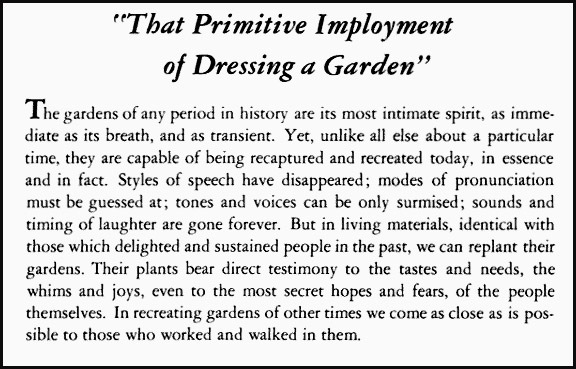 American Gardens in the Eighteenth Century is the second volume about garden history by Ann Leighton. She drew from letters, journals, invoices, and books of men and women who were interested in the plants of the New and Old World. As with the first volume, she included illustrations and descriptive listings of native and new plants that were cultivated during the eighteenth century. American Gardens of the Nineteenth Century is the final of the three volumes of garden history by Ann Leighton, and includes reproductions of contemporary illustrations and descriptive listings of native and new plants that were cultivated during the nineteenth century. In this volume she connects the natural landscape with the growth of the industrial age and cultural change in nineteenth-century America. What a wonderful little piece of Ipswich history. I would love to find Mrs. Smith’s books. Thanks for writing this up! The gardens at the Foster Grant House ( behind, unfortunately not visible from Summer St.) were designed by MaryAnn Tolvanen in the 1970’s and are filled with traditional native plants and contain we believe many elements particular to this area.